The Ching Soo Firecracker is a classic effect from years gone by! It's a comedic routine wherein the magician lights a large firecracker, then quickly places it into a tube for the spectator to hold. Comedy ensures, then the spectator is finally coaxed into uncapping the tube and removing the firecracker. When he uncaps the tube, inside he finds only a red silk...the firecracker has vanished! The magician and spectator proceed to frantically search for the firecracker and eventually find it dangling from the spectator's back! This is a very funny routine and was a "standard" in most kidshow magicians' acts some years ago. I believe this is an original Rings 'n' Things set. It is in the same type pouch they supplied for their set and it is made in brass like they did, but there are no markings. 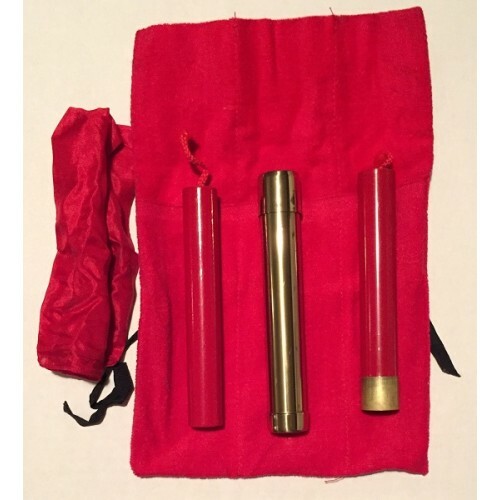 It's a lovely brass tube with matching cap (this cap is NOT split as with so many that are offered), the gaffed firecracker, wooden firecracker, red silk and storage pouch. This outfit does not appear to have been used. Does not come with instructions or fuse (obtainable inexpensively at gunshops and many sporting goods stores). As with most items in my "Used/Collectible" category, I have ONE ONLY.